Spain ceded Florida to the British in 1763, who then gave control back to Spain in 1783. The first permanent settlement in modern Jacksonville was settled as "Cowford" in 1791, ostensibly named for a narrow point in the St. Johns River where cattlemen could ford their livestock across. The Florida Territory was ceded to the United States in 1821, and in 1822, Jacksonville's current name had come into use. U.S. settlers led by Isaiah D. Hart authored a charter for a town government, which was approved by the Florida Legislative Council on February 9, 1832. During the American Civil War, Jacksonville was a key supply point for hogs and cattle leaving Florida and aiding the Confederate cause. 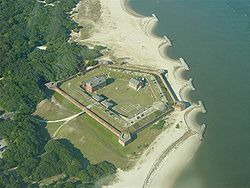 The city was blockaded by the Union, who gained control of the nearby Fort Clinch and controlled the city and most of the First Coast for the duration of the war. Though no battles were fought in Jacksonville, it changed hands several times, and the city was left in a considerable state of disarray after the war. During Reconstruction and the Gilded Age, Jacksonville and nearby St. Augustine became popular winter resorts for the rich and famous. Visitors arrived by steamboat and later by railroad. President Grover Cleveland's attended the Sub-Tropical Exposition in the city on February 22, 1888 during his trip to Florida, which increased the visibility of the state's worthiness as a place for tourism. The city's tourism, however, was dealt major blows in the late 19th century by yellow fever outbreaks and the extension of the Florida East Coast Railway to south Florida. On May 3, 1901, downtown Jacksonville was ravaged by a fire that was started at a fiber factory. Known as the "Great Fire of 1901", it was one of the worst disasters in Florida history and the largest ever urban fire in the Southeastern United States; it destroyed the business district and rendered 10,000 residents homeless in the course of eight hours. It is said the glow from the flames could be seen in Savannah, Georgia and the smoke plumes in Raleigh, North Carolina. Famed New York architect Henry John Klutho was a primary figure in the reconstruction of the city. More than 13,000 buildings were constructed between 1901 and 1912. In the 1910s, New York-based moviemakers were attracted to Jacksonville's warm climate, exotic locations, excellent rail access, and cheap labor. Over the course of the decade, more than 30 silent film studios were established, earning Jacksonville the title "Winter Film Capital of the World". However, the city's conservative political climate and the emergence of Hollywood as a major film production center ended the city's film industry. One converted movie studio site, Norman Studios, remains in Arlington; It has been converted to the Jacksonville Silent Film Museum at Norman Studios. During this time, Jacksonville also became a banking and insurance center, with companies such as Barnett Bank, Atlantic National Bank, Florida National Bank, Prudential, Gulf Life, Afro-American Insurance, Independent Life and American Heritage Life thriving in the business district. The U.S. Navy also became a major employer and economic force during the 1940s, with the construction of three naval bases in the city. Jacksonville, like most large cities in the United States, suffered from negative effects of rapid urban sprawl after World War II. After World War II, the government of the City of Jacksonville began to increase spending to fund new building projects in the boom that occurred after the war. Mayor W. Haydon Burns' Jacksonville Story resulted in the construction of a new city hall, civic auditorium, public library and other projects that created a dynamic sense of civic pride. However, the development of suburbs and a subsequent wave of "white flight" left Jacksonville with a much poorer population than before. Much of the city's tax base dissipated, leading to problems with funding education, sanitation, and traffic control within the city limits. In addition, residents in unincorporated suburbs had difficulty obtaining municipal services such as sewage and building code enforcement. In 1958, a study recommended that the City of Jacksonville begin annexing outlying communities in order to create the needed tax base to improve services throughout the county. Voters outside the city limits rejected annexation plans in six referendums between 1960 and 1965. In the mid 1960s, corruption scandals began to arise among many of the city's officials, who were mainly elected through the traditional good ol' boy network. After a grand jury was convened to investigate, 11 officials were indicted and more were forced to resign. Consolidation, led by J. J. Daniel and Claude Yates, began to win more support during this period, from both inner city blacks, who wanted more involvement in government and whites in the suburbs, who wanted more services and more control over the central city. The simultaneous disaccredation of all fifteen of Duval County's public high schools in 1964 added momentum to the proposals for government reform. Lower taxes, increased economic development, unification of the community, better public spending and effective administration by a more central authority were all cited as reasons for a new consolidated government. A consolidation referendum was held in 1967, and voters approved the plan. On October 1, 1968, the governments merged to create the Consolidated City of Jacksonville. Fire, police, health & welfare, recreation, public works, and housing & urban development were all combined under the new government. The Better Jacksonville Plan, promoted as a blueprint for Jacksonville's future and approved by Jacksonville voters in 2000, authorized a half-penny sales tax to generate most of the revenue required for the $2.25 billion package of projects that included road & infrastructure improvements, environmental preservation, targeted economic development and new or improved public facilities.